The Maui team is happy to announce the release of Maui 1 “Aurora”. This is the continuation of the ubuntu-based desktop version of Netrunner (read about it here). The biggest underlying change has been rebasing Maui from Kubuntu to KDE neon (Xenial LTS). That means Maui will now be receiving continous updates and support until the next ubuntu-based LTS in 2018. During that timeframe, we plan to release updated ISO versions every 3-4 months with the latest KDE software plus other updates. Interesting concept, you should have taken the time to do a proper screenshot though, one with more than an 800×600 resolution, it looks silly and new users who don’t understand what’s going on might not try it based solely on the fact that the screenshot doesn’t look like a desktop they would want to use. Instead of Firefox, could you consider SLIMJET? atm I’m using Version 11.0.3.0 (based on Chromium 51.0.2704.84). Install “Slimjet_amd64.deb” (54.0 MB (56,630,822 bytes, created ‎Monday, ‎1 ‎August ‎2016, ‏‎11:03:45 PM) by double-clicking, then it auto-updates with an auto-installed PPA. 50 / 173 of my add-ons are enabled, on whatever operating system I happen to be using the last time. My multi-booting Dell XPS-15 notebook can chose any operating system from ten (10) Linux systems, or three (3) Windows systems. My Firefox based browsers are very slow to load and exit, by comparison. They crash easily, especially the pure Firefox brands. In Windows, that is why I prefer Waterfox, Cyberfox to Firefox; fewer crashes. I use Firefox all the time in Linux with 20+ add-ons loaded and it never crashes for me. I don’t think it will be included by default. It is a marginal browser within the already overcrowded Chromium-ecosystem. Personally, I’d prefer Vivaldi anyway. Also a great choice for privacy, as it is Norwegian/Icelandic made. Brave could be a good choice for privacy too. If Netrunner is a KDE Neon based distro, we can’t use the driver manager to install proprietary drivers and NVIDIA Panel then isn’t it? We are currently testing a solution to bring it back to neon/maui. Will post a how-to when ready and include it in Maui 2. Hello, I know and have heard that there is a move from 32 bit machines to 64 bit. Will there be a 32 bit version? I am currently using 14.2 and it has done everything that I want it to do. Do I have to get new machines. As far as I am aware there is no 32bit version planned. 64bit is the way to go nowadays. You can however stay on Netrunner 14.2 as long as the underlying Ubuntu is supported. As I understand Leszek – no, there won’t. Since Maui 1 the’re doing 64 bit only. I have so much enjoyed using Netrunner. my 32-bit machines runs very well on it. I suppose a lot of other people will have to find a different version to run. That’s a lie. You didn’t search a long time for a stable Plasma and no, it’s not true they all freeze. You only want to look a knowledgeable person and you like to butter up people expecting recognition from them. Whatever !. still stable, the best Debian Plasma ! I love Antergos KDE (I have it in my laptop) but unfortunately it didn’t combine perfectly with my main computer. After Linux Mint I needed something a little bit more polished and new. It was a very nice surprise to know that this combination (Neon + Netrunner) existed. It will be in Maui 2, give them some time. The main focus is a stable plasma, and it’s the only KDE that works with 3 screens without freezing ! My question is why not continue the netrunner line? Is it because of the name? Yes, Netrunner base will be specialized to serve well on microcomputers like rpi or odroid, which kinda conflicts with the mainstream desktop philosophy of Maui. What about Community Support? Are the old forms going down and this site being the only place to go to despite not having a community and only having Facebook to rely on? All accounts from Netrunner should be working here as well without reregistering. The new base basically starts from scratch, though also the posts have been tranferred just in case. The upcoming base for Netrunner would also mean to start with fresh Categories over there. Very nice distro. Installed it and working with it. Thanks! 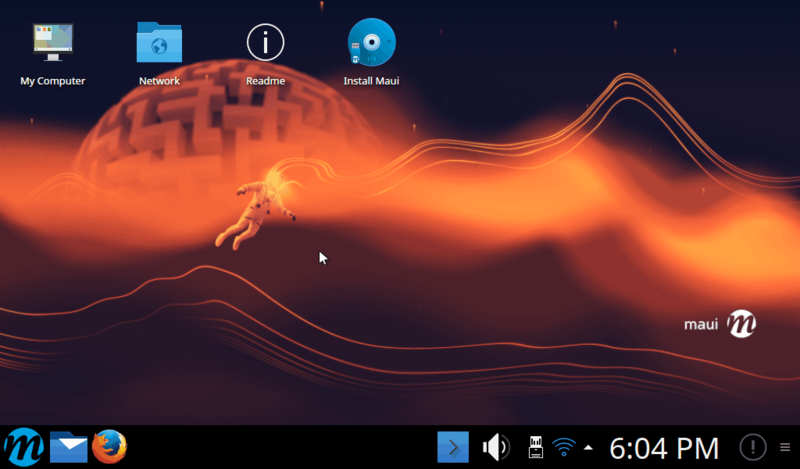 Remember this is the first version on the new base and KDE neon is also relatively young, but both projects are working full ahead to iron out any quirks or issues on the ubuntu base. Am I correct in understanding that .deb or .rpm files cannot be installed on this distro? If so I’ll sadly have to say bye to netrunner as I need Smart Notebook (an interactive white board application) for work and any distro which does not allow a, relatively, painless installation of it and its dependencies is useless to me. yes you can it’s Debian based (stable release of KDE Neon ), no problems with installing software. Just to be sure. Did you disable secure boot ? Maui ships an updated kernel which seems not to be signed for UEFI secure boot. Secure boot is disabled. The Maui live usb boots fine, but when installed it fails booting. Excellent distro! Very smooth and stable on my system. Has just about everything I need out of the box. I see a lot of potential here! Keep it up! What can I say.. this, my friends, is already a wonderful distro, and it’s only at its 1st release. Congrats Maintainers, you did an amazing job. You made me save my time, I love the distro’s defaults, I have left them as they are so I can just focus on my work. I can’t be thankful enough. Please take care of this project for as long as you can. Thank You again. Is there any instruction how to update from netrunner 17? * In System Settings the whole “On-line Accounts” section does not work. I downloaded some Google libs to link with my Google calendars etc., but it still throws an error. I haven’t figured out yet which one I have to install. * It came to my notice that Maui 1 lacks a good software browser by default (Synaptic PM is just a GUI for apt and can’t be considered a software browser). Plasma Discoverer, Muon – what’s on the top in KDE now? 1920×1080 (or something like that). So this new thing is not Arch based? No AUR? Can’t easily install OpenOffice or Viber from the AUR? Besides Manjaro what is the next best Arch based rolling distro? I tried it today, I had a number of problems with it, so tried Manjaro before going back to it and Manjaro worked perfectly. Like Netrunner Rolling except it has a current Install that works. Since it is not rolling does that mean I wil have to reinstall it all the time? Congrats to Devs; this distro is v nice! Have been testing it for a week in a VM, like it a lot, & am now close to being ready to install it over my real OS, but have concerns over security. Pls would you sign your ISO & Checksum files with your private PGP key, & post your public key in a top keyserver, so i can then confidently validate the ISO before i install it “for real”. I know your ISO & Checksum are currently on https site, but would prefer better security via PGP… please? will you be updating to 5.8 ?